In this fingerstyle tutorial you’ll learn the essential fingerpicking exercises you need to know in order to play most of the solos and arrangements from the great fingerstyle jazz guitarists, such as Lenny Breau, Joe Pass and Ted Greene. Although this article is intended mainly for jazz players interested in fingerstyle guitar, the following fingerpicking patterns are well suited to developing fingerstyle techniques regardless of what style(s) you play. If you are a beginner at fingerstyle guitar, I recommend that you start from the beginning of the fingerpicking exercises and work sequentially one at a time, focusing mainly on the ones that use open strings. If you are more advanced, feel free to skim through the first few exercises but be sure to have a good look at the challenge studies throughout the lesson. Handy PDF Download: Get access to a print friendly version of all the exercises and studies in this post for your practice. I’m sure you’ve come across books that attempt to show you every inconceivable fingerstyle pattern and technique that’s possible. However, most can be boiled down to just a handful of fingerpicking exercises, which will enable you to play nearly any fingerstyle jazz guitar transcription that’s out there. As you’ll see, there really isn’t that many patterns you need to know. Regardless of what stage you are at in your fingerstyle guitar journey, keep in mind the points of correct right hand technique below, so you don’t fall into any bad habits. In fingerstyle jazz guitar there is no set way in the method that guitarists use to pluck the strings. Feel free to experiment with fingerpicks, growing your fingernails, or using the flesh of the fingers only. You could also try hybrid picking where you hold a pick with the thumb and forefinger and play fingerstyle with the other remaining fingers. I use fingernails to pluck the strings, but they do break occasionally, so when they do I temporarily use an Alaska Pik fingerpick until the nail grows back. Many of these exercises alternate the fingers between the index and middle fingers, or index and ring fingers. In the above example, I’ve indicated to play the exercise with i and m fingers, then once you are comfortable with that try with p and i. The ‘sim’ means to continue the finger pattern for the exercise. In fingerstyle jazz guitar (and most other fingerstyle genres), the thumb is usually reserved for the bass notes on the 6th, 5th and 4th strings. Walking finger exercises are a good start for a beginner of fingerstyle technique. These exercises are pretty straightforward, however even if you are a more advanced player, check that you have good technique in your strokes as outlined below. There are two guitar fingerpicking stroke types that are important to learn for fingerstyle jazz guitar. Take note of the correct finger picking action that the video above demonstrates. Many people develop poor fingerstyle technique by not being careful about their stroke motion when they’re first learning, and this can be tedious to correct down the track – so make sure you get this right from the start! Rest Stroke – pluck the string and then rest the finger on the string immediately adjacent to the string you plucked. Notice in the video how the fingers lean back a little when doing this type of stroke. Free Stroke – pluck the string and don’t rest on any adjacent strings. Notice in the video how the fingers are more curved and positioned slightly forward of the string being plucked. The motion is similar to picking up a tennis ball, with the tips of the fingers moving into the palm of the hand. For free stroke, be particularly careful to avoid moving the fingers away from the palm of the hand – this will cause tension to build up in your hand and will inhibit your speed and fluency. Now that you are familiar with walking fingers, have a go at this short walking finger study. It sounds particularly nice if you try to hold on to the notes with your fretting hand as long as possible, so the notes ring on over each other (called a campanella effect). Walking fingers can get tricky when you move from string to string, as you might tend to repeat a finger upon crossing strings. Be careful in the following fingerpicking exercises to ensure the fingers keep walking no matter what – as opposed to hopping! Now that you’ve got this finger picking technique secure, here’s a little study I wrote as a string crossing workout. The fretting hand has to do a few tricky chord grips in this one. Like the last study, it sounds good if you try to keep the fingers held as long as possible on each chord, with the open strings ringing on creating that neat campanella effect. In fingerstyle jazz guitar, the thumb is the bass player – playing single bass notes beneath chords or the odd bass line run. This is where these fingerpicking exercises can get tricky for a beginner! As the video below details, when you are using your thumb on these exercises, be careful that it doesn’t collapse into the palm and instead remains on the outside of the palm, otherwise your index finger and thumb will get in the way of each other when fingerpicking. Rest strokes won’t work here as the notes are always on adjacent strings, so just stick to free stroke for these fingerpicking exercises. As you can tell, I’ve been a fan of mixing open strings with picking patterns lately. This study should test out your fretting hand chops too! This is where things start to get a bit more interesting. There are some great patterns to learn when you start using the thumb in combination with two other fingers. Check out the video below for how the exercises should look and sound. When I was more into classical guitar I practiced a well known set of 120 right hand studies by Mauro Giuliani. I was so dedicated to practicing these I would try to practice all 120 – every day! Although there were many useful patterns in the set, all of them were on a straight I – V7 – I progression. Boring! I couldn’t bring myself to inflict this on you as well, so here are a couple of similar fingerpicking exercises but with some more interesting chord progressions. Enjoy! These are similar exercises to the previous section. All you have to do now is add on the ring finger (that’s what the ‘a’ letter is referring to in the examples below). 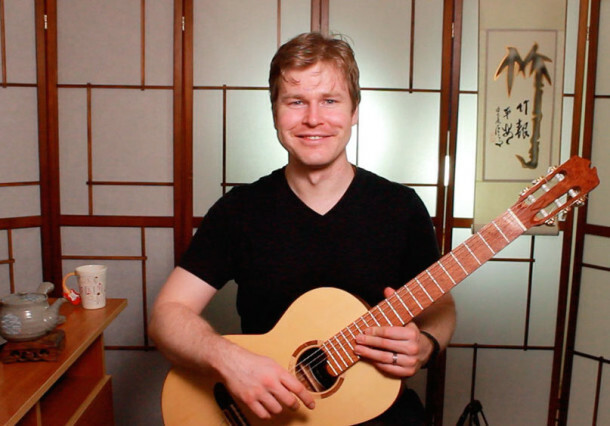 10 Essential Fingerstyle Jazz Guitar Exercises – my good friend Matt Warnock has some exercises here that apply several fingerstyle patterns to more standard jazz chord progressions. Also check out this post on jazzguitar.be about applying classical guitar techniques in a jazz context. For styles outside of jazz, Klaus Crow from Guitarhabits has a great post demonstrating some classic folk/pop patterns here. Also check out the lessons available on fingerstyleblues.com for more fingerpicking ideas. I know a lot of the readers of my blog are interested in fingerstyle technique for jazz, and I’ve noticed there isn’t a lot of information out there online on the subject so I hope that this fingerstyle tutorial helps you get started and improve. I like them all. The exercises are very good for Jazz beginners to start with for developing finger style rhythm playing. Thanks you for the posts. Thanks for your kind feedback Paul, glad you are enjoying the posts! Thanks for posting this lesson. Looks to be very helpful. Exciting..Slow steps makes for a great future for jazz guitar.